1920 Crosley's first radio was a crystal Set named "Harko", introduced as the first low priced radio at $20.00 retail, it later sold for $9.00. A roaring success, the Harco was recognized for making radio available to the masses. Earned Powel Crosley the reputation "The Henry Ford of Radio". 1921 Crosley's first radio broadcast was 8XY. 1922 Crosley received license in March for WLW Radio Station. 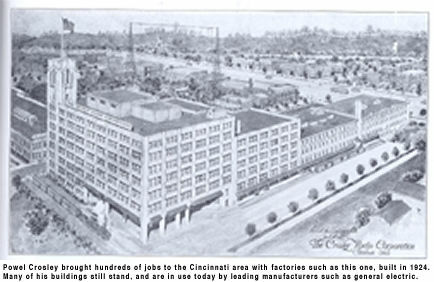 Crosley was the largest radio manufacturer in the world. 1922 WLW was among the first regular scheduled radio stations on the air starting in January. A total of only 28 stations were in operation throughout the U.S.
1923 Crosley radio station reached 500,000 watts, the most powerful station in the world. 1925 Crosley designed its own airplane called the "Moonbeam". 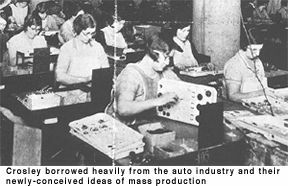 1927 The Crosley Corporation nets over $3 million in profits on $18 million in sales, making it the number one radio manufacturer in the world. 1930 Crosley was the first radio station to broadcast from an airplane. 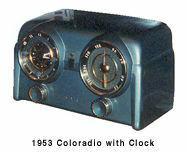 Crosley entered the National Air Race from the West Coast to Chicago, broadcasting from the plane across the country. 1930 First car radio called the Crosley "Roamio" was introduced by Crosley. 1934 WLW began broadcasting what is now known as "soap operas". 1937 WLW merchandised to 345 mid-western cities by radio. 1939 Crosley introduced the first small car in the world. First car with disc brakes. 1939 Crosley started TV broadcasting in Cincinnati, Ohio. 1940 WLW became the first station with its own full-time weatherman. 1940 Crosley introduced first FAX machine called "Reado". 1941 WLW started broadcasting radio programs from its own farm which became known as "Everybody's Farm". 1943 The Crosley transmitter, during World War II, became the nation's propaganda station with its 500,000 watts that could be heard in many parts of the world. 1946 Crosley's first regular TV station began regularly scheduled telecasting. 1947 Crosley began a regularly scheduled telecast of 20 hours a week. First baseball game to be broadcast on TV. 1948 Crosley WLW-TV became the first NBC-TV affiliate. 1954 Crosley pioneered the first TV portable which became the best selling set in the industry. 1957 Crosley WLW began telecasting color programs. Crosley's own Cincinnati Reds baseball team became the first sports program ever broadcast in color.